His greatest achievement was the Olympic bronze medal in 2000. This was his first medal at a major international event, having barely missed the podium at the 1995 World Cross Country Championships (5th place) and twice in 5000 metres at the World Championships; 1995 (5th) and 1999 (fourth). He did win a bronze medal in 3000 metres at the 1998 African Championships. He has the fastest 5000m time for a runner from neither Kenya nor Ethiopia (12:49.28). The 5000 metres or 5000-meter run is a common long-distance running event in track and field. It is one of the track events in the Olympic Games and the World Championships in Athletics, run over 12.5 laps of a standard track. The same distance in road running is called a 5K run. The 5000 m has been present on the Olympic programme since 1912 for men and since 1996 for women. Prior to 1996, women had competed in an Olympic 3000 metres race since 1984. The 5000 m has been held at each of the World Championships in Athletics in men's competition and since 1995 in women's. 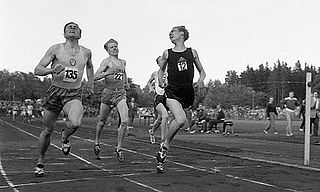 The 1500 metres or 1,500-metre run is the foremost middle distance track event in athletics. The distance has been contested at the Summer Olympics since 1896 and the World Championships in Athletics since 1983. It is equivalent to 1.5 kilometers or approximately ​15⁄16 miles. A half marathon is a road running event of 21.0975 km —half the distance of a marathon. It is common for a half marathon event to be held concurrently with a marathon, using almost the same course with a late start, an early finish or shortcuts. If finisher medals are awarded, the medal or ribbon may differ from those for the full marathon. The half marathon is also known as a 21K, 21.1K or 13.1 miles, although these values are rounded and not formally correct. Million Wolde is an Ethiopian athlete, winner of the 5000 metres at the 2000 Summer Olympics. Jaouad Gharib is a Moroccan long-distance runner who competes in the marathon. Winner of the 2003 World Championships and 2005 World Championships over the distance, he is also notable because he only began running seriously at the age of twenty-two. His 2005 retention made him one of only two successive world championship marathon champions, after Abel Antón. He was the silver medallist in the marathon at the 2008 Summer Olympics. Ahmad Hassan Abdullah is a long-distance and cross country runner, now representing Qatar after his switch from Kenya in 2003. Other runners who have made the same switch include Saif Saeed Shaheen. Ayelech Worku is an Ethiopian long-distance runner, most known for winning two World Championships bronze medals on the 5000 metres. She was born in the Arsi Zone of the Oromia province, the same region as double Olympic champion Haile Gebrselassie. Mohammed Mourhit is a Belgian top cross country, middle and long distance runner who holds two European records, in the 3000 m and 5000 m. He is also a former European 10000 m record holder. He won a bronze medal at the 1999 World Championships in the 5000 metres and a silver medal at the 2001 IAAF World Indoor Championships in the 3000 metres behind Hicham El Guerrouj. Mourhit was also a two-time winner of the IAAF World Cross Country Championships in the long course in 2000 and 2001. He also won the Lisbon Half Marathon 1997. Khalid Boulami is a former long-distance runner from Morocco. Most notably he won a bronze medal in the 5000 metres event at the 1996 Summer Olympics. Günther Weidlinger is an Austrian long-distance runner who is a former 3000 metres steeplechase specialist but now competes in the marathon. Abreham Cherkos Feleke is an Ethiopian long-distance runner. A former track specialist, he now competes in road running events including the marathon. Bouchra Chaabi is a Moroccan long-distance runner who specializes in the 3000 metres steeplechase. Abderrahim Goumri was a Moroccan long-distance runner. He had competed in cross country, track, road running and marathon races. Ahmed Ibrahim Baday is a Moroccan long-distance runner who specialized in the 5000 metres and cross-country running but now competes in road running competitions. He is currently banned for doping. Brynhild Synstnes is a retired Norwegian long-distance runner who specialized in 3000/5000 metres and later marathon. She represented Lillehammer IF and SK Vidar during her heyday. Mariya Ivanovna Konovalova is a Russian long-distance runner. She has represented Russia in both track running and cross country running and was the silver medallist at the 2006 European Cross Country Championships. She has competed at the World Championships in Athletics on four occasions and ran for Russia at the 2008 Beijing Olympics. Mohamed Issangar is a retired Moroccan long-distance runner who specialized in the 5000 metres. Brahim Jabbour is a retired Moroccan long-distance runner. He specialized in the 5000 metres. Daniele Meucci is an Italian athlete who specialises in long-distance running, including track running, cross country and road running. He represented Italy at the 2012 Summer Olympics, running in the 5000 metres and 10,000 metres. Simon Chemoiywo is a Kenyan former long-distance runner. He competed in track, cross country and road running. At the IAAF World Cross Country Championships he twice represented Kenya: in 1994 he was the runner-up and team champion, then helped retain the team title for Kenya at the 1995 race. John Barry Nuttall is a British former long-distance runner who competed in track and cross country running. He competed for Great Britain at the 1996 Summer Olympics. He also represented his country twice at the World Championships in Athletics and five times at the IAAF World Cross Country Championships. He was a silver medallist at the 1994 IAAF World Cup and a bronze medallist at the 1994 Commonwealth Games. ↑ ""Four great cities in the race – from three different continents" and the winners are Daegu 2011 and Moscow 2013" (PDF). IAAF. Archived from the original (PDF) on 2 July 2007. Retrieved 21 April 2007. ↑ Beogradska Trka Kroz Istoriju Archived 29 May 2010 at the Wayback Machine . (in Serbian). Belgrade Marathon. Retrieved 19 October 2009. 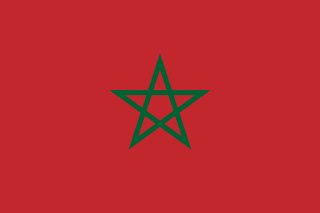 This biographical article relating to Moroccan athletics is a stub. You can help Wikipedia by expanding it.